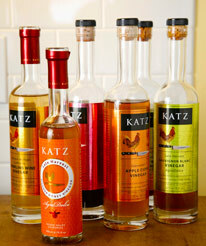 Welcome to our KATZ Farm collection of seasonal recipes. Our exclusive recipes highlight our artisan-made products and offer inspiration for creating simple, healthy and elegant dishes in your own kitchen with fresh seasonal ingredients. They are in a format that easily can be viewed and printed. Some of these family recipes are our old time favorites that we have been using for many years, but others are newly inspired by the bounty that surrounds us in the food-centric area we live in. More recipes will be added with the seasons…so please come back and visit us often!